Goalkeeper Mathew Ryan feels Albion have already experienced the ups and downs of a season in the opening month of the new Premier League campaign. 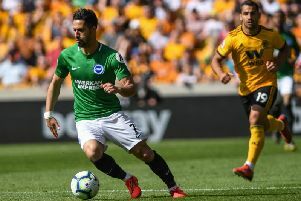 Brighton lost their season-opener after a disappointing performance in their 2-0 defeat at Watford but responded with a superb display in the 3-2 victory against Manchester United. A positive performance in the 1-0 loss at Liverpool followed, before the Seagulls fought back to draw 2-2 with newly-promoted Fulham last week after trailing 2-0. Brighton are 14th with four points from as many games and looking at the start to their season, Ryan said: “It’s been a mixed bag. There’s been the ups and downs of a season. “We’ve been good in patches and have needed to do better in other patches. “All in all, we’ve got four points from four games and our target is always to have at least equal or more points than games played. “But we’ve fallen short, to be honest, is the way I view it. “We’ve been in games and there’s been little moments in games where we haven’t been good enough and that’s where it’s hurt us. I had aimed to have more points than what we have at this moment but the season is long and the goal is to get as many points as we can. Ryan added Albion want to make the Amex a fortress again. The Seagulls lost just four of their 19 home league games last season as they picked up 29 points. They have four points from their two home matches this year but Ryan was disappointed not to collect all three from their last outing against Fulham. He said: “We pride ourselves on our home form and try to make the Amex a fortress. We wanted three points against Fulham and we fell short of that. Albion return to action on Monday when they travel to Southampton.